Epilay™ PlyStiK™ PLUS is an extremely strong roofing underlayment with a 48 mil thickness and a 2 square roll weighing 48 lbs. These unique design features when coupled with exceptional tear strength and excellent adhesion allows the contractor to easily carry the roll up and down the ladder. It is available in 2 square (3ftX66.7ft) rolls. Epilay™ PlyStiK™ PLUS Roofing underlayment with its advanced engineering is highly recommended for Self Adhered Peel & Stick, coated woven synthetic roofing underlayment for sloped roofs. Epilay™ PlyStiK™ is a Top of the line Premium Heavy Duty Commercial underlayment specifically manufactured to replace the traditional asphalt based Sand and Granular Peel & Stick Underlayments. 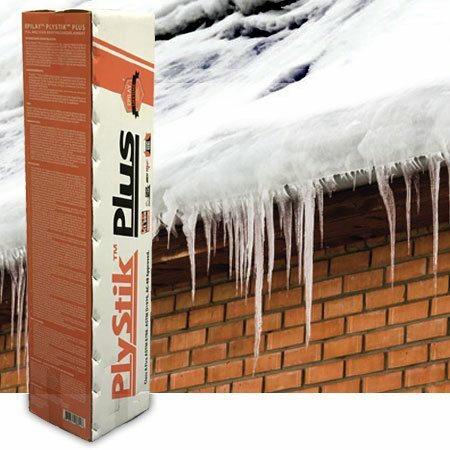 The adhesive layer is made from the advanced SBS Modified Bitumen based adhesive which performs extremely well in high as well as low temperatures and gives excellent adhesion to the primary roofing surface whether it is plywood or metal. The temperature performance range for Epilay™ PlyStiK™ Plus is -40° F to 260° F (-40° C to 126° C). It has a split release liner with silicone coating on both sides which helps in easier installation. Epilay™ PlyStiK™ PLUS’s GripWalk™ is a unique gray top layer which provides for a cooler working surface can be used under primary roofing materials to replace other low end traditional asphalt based Peel & Stick products. GripWalk™ high traction walking surface permits easier steep slope walk-ability, even during high condensation or moisture on the surface.